The latest addition to the range of ECU remaps from global leader Superchips releases additional power and torque from the 200PS 2.2-litre i4 Td engine used in the Jaguar XF range. The XF is marketed under the ‘Driving pleasure shouldn’t cost the earth’ banner and the Superchips remap matches this philosophy, by increasing engine performance while at the same time, helping to potentially improve fuel consumption. The 2.2-litre turbodiesel is fundamentally the same unit used in the Ford range and from the factory, produces 200PS or 197bhp. 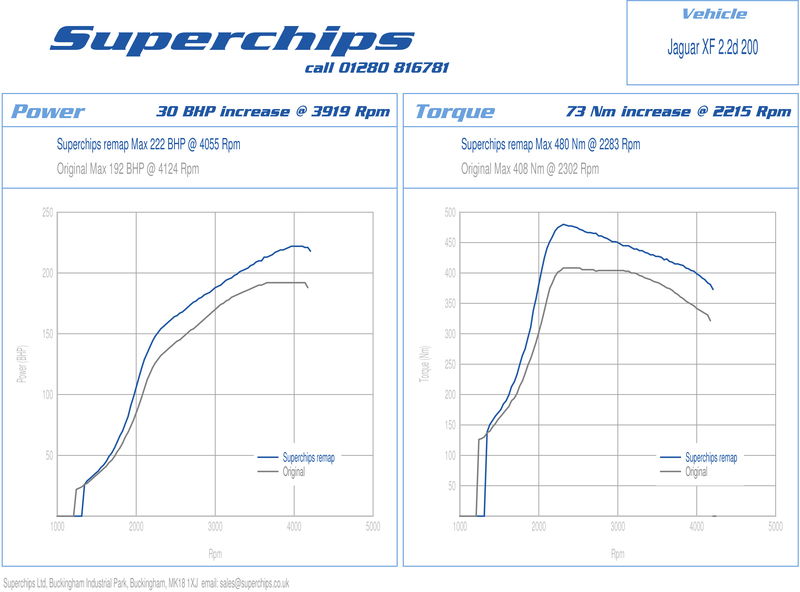 The Superchips conversion, which can be applied either by a dealer or via the Bluefin device, increases engine power by 30bhp at 3919rpm and by an impressive 73Nm of torque at 2215rpm. This makes the car far more responsive and enjoyable to drive, with the additional power available throughout the rev range. An additional benefit is that drivers can expect to notice improvements in fuel economy when the car is driven in a comparable manner to before. The conversion can be carried out either by a Superchips dealer or by the owner themself, using Superchips’ Bluefin device, which connects to the car’s on-board electronics via the diagnostic port. The cost of the remap is £365 inclusive of labour and VAT if applied by a Superchips dealer or £399 including VAT for supply of the Bluefin device. The remap is covered by Superchips’ industry-leading 12-month/30,000-mile warranty*. Click the following hyperlink for more information or to buy the Jaguar XF remap. * Terms and conditions apply. See website for details.